If you are looking to grow your family, please consider Tsong Law Group, APC and Adoption California. Tsong Law Group practices reproductive law, which includes egg, sperm and embryo donation contracts, and surrogacy agreements. 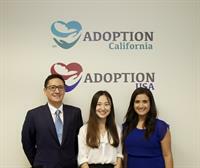 Adoption California is a full service adoption law firm, providing assistance with newborn adoption, step-parent, relative, foster, adult adoption, and international re-adoption. The founder Ralph Tsong is passionate about family formation law and is sensitive to your needs and concerns.